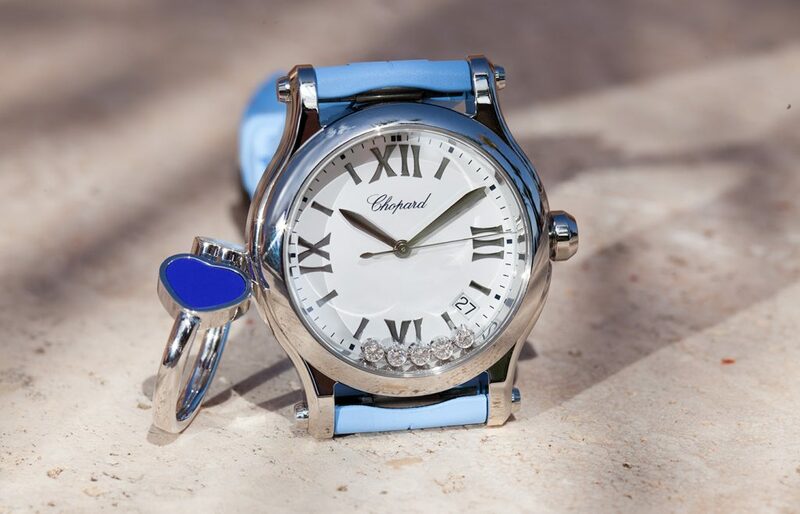 Chopard is synonymous with womanhood, elegance, and a dazzling interpretation of feminine timepieces and jewellery. But it also boasts a mechanical tradition and competence, inherited from a history that stems from the production of mechanical watches of prestigious quality and innovative and artistic forms, intended for prestigious personalities such as Tsar Nicholas II of Russia. A tradition that the company, still independently run by the same family, represents through the mechanics of its watches and preserves by exploiting the mastery and the experience of professionals specialised in over 30 different sectors, as found in both Swiss watchmaking and jewellery production. Every Chopard creation has a strong identity, which makes the style of a Chopard creation unmistakeable. Soft shapes, classical elegance married with innovative and creative details. A case in point are the diamonds that freely spin above the watch dials or in Chopard jewels, creating a unique and extremely feminine movement, a glitter of light. The feminine Happy Sport watches, a very cutting edge fashion statement in 1993, represent the first successful experiment in combining precious diamonds with stainless steel. A winning challenge, thanks to the brilliance of the diamonds, free to rotate on special settings placed in an invisible cavity between two sapphire glasses positioned over the dial. An idea that has led to an unmistakeable style for very sporting watches which are nevertheless elegant and feminine. The Mille Miglia collection, which owes its name to the legendary Italian race for which Chopard was the Official Timekeeper for over 25 years, is a tribute to the car races of the past. A style that it shares with the Grand Prix De Monaco and the Superfast collections; men’s watches of considerable size and featuring coloured details reminiscent of the world of sports and motorcars. The mechanical expertise of the Chopard tradition has led to the creation of a line of mechanical watches that incorporate the know-how of top flight Swiss watchmaking. Models for both men and woman, made by hand in the Swiss workshops in Fleurier, include watches with a very classical design or provided with mechanical complications such as calendars, chronographs or time zones. IMPERIALE, the most feminine of all Chopard’s watch collections, stands out for its strong lines and its attention to detail. Chopard’s Imperial watches are a tribute to modern empresses that don’t need a crown to establish their majesty. A clock has an internal mechanism that is made up of many cogs that are constantly moving and coming into contact. That’s why Chopard suggest that every watch should be checked every 4-5 years, partly to guarantee the reliability of the watch and verify the conditions in which it has been used. In this way one can assess the need for a thorough servicing to clean the mechanism of any lubricant oils, which over the years are naturally bound to lose their effectiveness, ensure that the case is still watertight and that the watch is in top working condition. For battery change operations, Chopard recommends contacting an authorized Servicing Centre that will have the equipment and tools required to carry out the operation and is certified to operate according to professional standards. For all watches, but in especially those that come into contact with water, Chopard recommends checking that the case is still watertight every year. One can ask for a free wet test to confirm water tightness from the Hausmann & Co. Servicing Centre. We offer a complete package of services covering every operation your watch may require. Servicing, which essentially means a thorough overhaul and repair of your watch, involving the complete dismantling of the watch and its internal mechanism and repairs to all components that are essential to the watches mechanical operation. Regulation and demagnetisation, to solve erratic behaviour by your watch. These operations are quick to perform if the mechanisms are in good condition. Battery changing, done by taking the required precautions, seeing as the operation, albeit simple, does mean opening the watches' back. Case and bracelet polishing, required to get the watches' steel or gold to gleam once more. Repairs or replacement of bracelets and other aesthetic watch parts, even with the support of specialist goldsmits. Strap replacement, which includes restoration of original buckles that may have lost their sheen over the years. Pressure testing for water resistance, free and advisable every aWe offer a complete package of services covering every operation your watch may require. 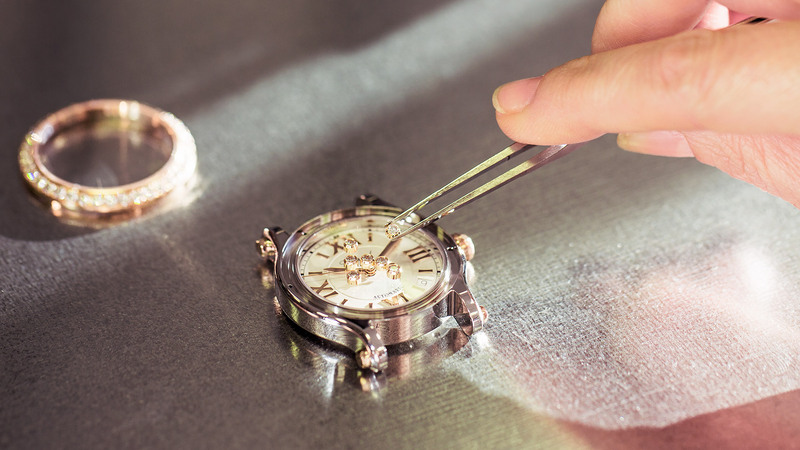 Servicing, which essentially means a thorough overhaul and repair of your watch, involving the complete dismantling of the watch and its internal mechanism and repairs to all components that are essential to the watches mechanical operation. Regulation and demagnetisation, to solve erratic behaviour by your watch. These operations are quick to perform if the mechanisms are in good condition. Battery changing, done by taking the required precautions, seeing as the operation, albeit simple, does mean opening the watches’ back. Case and bracelet polishing, required to get the watches’ steel or gold to gleam once more. Repairs or replacement of bracelets and other aesthetic watch parts, even with the support of specialist goldsmits. Strap replacement, which includes restoration of original buckles that may have lost their sheen over the years. Personal engravings, for special inscriptions on the watch Pressure testing for water resistance, free and advisable every as summer approaches! When is it advisable to have your mechanical watch overhauled?